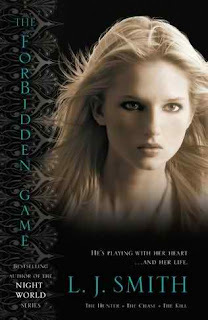 The Forbidden Game trilogy is L.J. Smith 's fourth series originally released in 1994 but recently re-packaged, as Smith's other series have massively increased in popularity. The Hunter is the first book in the Forbidden Game trilogy, following with The Chase and ending with The Kill . Jenny is a beautiful, blond, blue-eyed teenager who always manages to see the good in people. When she ventures into a magical and mysterious game shop to purchase a board game for her boyfriend's birthday party, she is unexplainably attracted to Julian, the shopkeeper. Later that night when Jenny and her friends play the creepy board game, all of them are transported into an alternate world where everybody's worst nightmares will come true. The Forbidden Game trilogy encompasses what every other novel by Smith has in terms of irresistable teenage romance, intrigue, and a touch of horror. I love how L.J. Smith can enfold you into a completely make-believe world and your imagination buys every minute of it. In comparison to The Secret Circle trilogy and The Vampire Diaries , I feel Forbidden Game lacks the strong rapport between characters usually prevalent in Smith's novels. I don't quite feel the intimacy between Jenny and her group of friends, and not one character really sticks out to me other than our main characters Jenny and the shopkeeper Julian. This may also be due to the fact I grew up alongside the aforementioned series when they released in the 1990s when I was a teenager, whereas I'm reading the Forbidden Game series for the first time this year as an adult. In other words, perhaps I'm lacking the teenage comaraderie? From the horror and plot standpoints, the series is truly scary and creepy, and Smith does an amazing job of pulling you into the adventure.